Tehran (also spelled Teheran) (Persian: تهران), is the capital city of Iran. A bustling metropolis of 14 million people, it sits at the foot of the towering Alborz mountain range. The city can be roughly divided into two parts - north and south. The northern districts of Tehran are more prosperous, modern, cosmopolitan and expensive while southern parts is less attractive but cheaper. At the time of the Zand dynasty, it was a little town that was significant from a strategic point of view. The first of the Qajar kings, Agha Mohammed Khan, named Tehran as the country's capital in 1778, and most of its growth started during the reign of a subsequent Qajar monarch, Fath-Ali Shah. The castle which Agha Mohammed Khan had built was to contain the new majestic buildings. At the same time, the city's populace was redoubled. Due to the increasing significance of the city, gates, squares and mosques were built and it was at the time of Nassereddin Shah that the city's master sketch was prepared and modern streets were constructed. Later, huge central squares like Toopkhaneh square (now Imam Khomeini) and quite a few military buildings were built. Even though the Qajar dynasty was in a period of decline, Tehran soon took the shape of a modern city. The structure of large government buildings, new streets, recreation centres, urban service organizations, and academic and methodical centres were started, even as most of the old gates and buildings were destroyed and the city's old architectural fabric replaced by a contemporary one. Tehran has also earned itself an unenviable reputation as a smog-filled, traffic-clogged and featureless sprawl of concrete bursting at the seams with 14 million residents. But you can also find an endless number of nice and cosy places in and around the city - if you know where to look. Tehran is also a city of more than 800 parks, all well-kept. The city is nearly a mile high above sea level and as a result is cooler than other cities in the middle east. Summer temperatures are around 32°C or (90-95°F). The air tends to be very dry. A combination of factors make Tehran a pleasant place to visit: the dry climate which is constantly cool (at least in the evenings), the proximity of the mountains, the parks and gardens where flowers blossom all through the year, the alleys of trees in the avenues or even smaller streets, and even the water that runs down from the upper city along deep and wide gutters which look like small rivers during spring. The Alborz range on the north of Tehran, which hosts the highest peak in Iran, provides fantastic conditions for ski lovers in the winter. In winter, the mountain hotels and ski clubs at Shemshak, and Dizine are full several days a week. Some specialist skiers consider the snow value in northern Tehran to be one of the most excellent in the world. For information on Iranian visas please refer the Iran#visas page. 1 Imam Khomeini International Airport (IKA IATA) (55 km southwest of the city center, Robat Karim railway station (ایستگاه راه آهن رباط کریم) around 3 km northwest near Line 1 'Kahrizak' ~ 20 km NE). The only airport in Tehran to which international passenger flights operate. Metro easiest way to reach city center is by metro line. New line number 8 connects Airport Terminal A with metro line 1 (red line) (75000 rials, that can be used for the full network, Mar 2019). Runs irregularly: 6.50, 8.10, 9.30, 10.50, 12.10, 13.30, 14.50, 16.10, 17.30, 18.50, 20.10. Buses between the airport and the city (e.g. Haram Metro station) run every 30-60 min 07:00-23:00. They leave right in front of the main exit and cost 20,000-30,000 rial. There are unconfirmed reports of a shuttle bus operating between IKIA and Mehrabad Airport every 4–5 hours. Taxis cost a fixed rate of 800,000 rials (or US$25 or €20 as of Oct 2017), ask at the taxi counter. The drive to/from the city center takes 45 minutes without traffic, but can take upwards of 90 minutes with traffic. There is a booth organizing taxis right outside the arrivals hall. You can also bargain with taxis dropping off passengers at the arrivals hall because otherwise they would have to go back to Tehran empty. Taxis to the nearest metro station (Haram-e-Motahhar) cost 500,000 rials. Shuttle taxis/green minibuses operate between the airport and Shahed Station on the red line of the metro. This can be a convenient option going to the airport from town, but finding the shuttle taxis at the airport will be difficult as many don't stop there. At 7000 rials for a metro ticket and 40,000 rials for a shuttle taxi (they will try to rip you off or charge for bringing in luggage even if there is space, so make sure to only occupy one seat if you don't want to pay extra), it is probably the cheapest option from town that doesn't require waiting a long time for the bus (shuttle taxis leave when full). At Shahed station, get out to the parking area (there is only one exit and you can't miss it) and on the very left you will see green minibuses. It takes about 30-40 min from there to the airport. Last one departs around 21:30. Metro Line 1 (Red) During daytime there is a metro from IKA to Tehran. The trains run hourly so check schedule (Sep 2017). 2 Tehran's Mehrabad airport (THR IATA). Mehrabad is only used for domestic and cargo flights. It is connected to Tehran Metro Line 4. Despite the warnings in some travel guides, there is no exit fee for foreign travellers, neither in Mehrabad nor in Imam Khomeini Airport. The exit fee applies to foreign travellers only when leaving Iran on land or by sea. 3 Tehran railway station (ايستگاه راه آهن تهران‎) (Closest metro station is Rahahan). Tickets can be bought from any station, from travel agencies or online from various train operator websites, such as Raja, Fadak, BonRail, Joopar, and Behtarinsafar. You could also use one of Iranian OTAs to buy your tickets online. Alibaba is recommended. There are at least one train each day from the Iranian cities of Mashhad, Isfahan, Tabriz, Kerman, Yazd, Sari, Gorgan, Ahvaz and Bandar Abbas. For Turkey, first travel to Tabriz. A train runs from there on Mondays around 23:30, to reach Van by 07:00 next morning. To continue west towards Ankara and Istanbul either take a bus from Van, or cross the lake to Tatvan for the twice-weekly train to Ankara. The eastbound train leaves Van 21:00 Tuesday to reach Tabriz by 07:30 Wednesday. The through-service "Trans-Asia Express" between Tehran and Ankara remains suspended. Traffic is very congested but has improved with the completion of several new tunnels and highways (referred to as autobahns by the locals) across the city. You can drive in from Turkey fairly easily as well as from the Southern parts of Iran. Although Iran has been always among the countries with high number driving accidents, the police have cracked down on accidents and driving is now safer than before. It is possible to rent a car at IKA airport, Mehrabad and in the city with Europcar. or SaadatRent. If you are going to use roads and ground transportation, there's a website maintained by the government's Ministry of Transportation and Urban Development available here or here that publishes roads' statuses. You might need to use Google Translate to understand the text when navigating through the pages. 4 Western bus terminal (Terminal-e-gharb, Azadi Bus Terminal), Northwest of Azadi Tower (a 10-minute walk north-west from Azadi Square, and a few minutes walk north from Azadi Square Subway Station). The biggest, busiest and best-equipped of Tehran's terminals. Most international buses, and those heading to the Caspian Sea region and destinations west of Tehran, originate and terminate here. The bus to Yerevan costs 1,800,000 rials and departs daily at 13:00. 5 Eastern bus terminal (Terminal-e-shargh) (7 km north-west of Emam Hossein square,). Handles buses from Khorasan province, and a few services from the north. 6 Southern bus terminal (Terminal-e-jonoob), Morsali, (take subway line 1 to Terminal-e-Jonoob station, then use the underground pass east to the bus terminal). Serves destinations south of Tehran, e.g. Kashan, Qom, Isfahan, and Shiraz. Ticket price for Isfahan around 300,000 rials and 600,000 rials for Shiraz. 7 Beihaghi bus terminal (Terminal-e-beihaghi, Shahvand Beihaghi), beside Arzhantin Square (around 1.5 km south-west of the Line 1 Mossallah metro stop (shared taxis to the terminal cost 10,000 rials in Sep 2016) or north-west of Shahid Beheshti metro stop). The station has services from most major destinations in Iran including Mashhad, Esfahan, Rasht, Shiraz, Tabriz and Yazd. A ticket from Esfahan costs 255,000 rials (Sep 2016). Getting around traffic-clogged, sprawling Tehran is a true test of patience. While taxis are your best bet, they are pricier here than the rest of the country. A large local bus network will also take you almost anywhere you need to go, as long you can make sense of the routes and Persian line numbers. The true star of Tehran's transport system, however, is the metro. Tehran has an inexpensive but confusing bus network. Some require prepaid contactless card (min 5,000 rials), which can be bought from booths beside the bus stops and metro stations used when you get off the bus, and some should be paid by cash (ranging from 1,000-4,000 rials). The buses are partitioned in two sections, men-only (the front section) and women-only(the back section). In the BRT lines, the women-only section is at the front. Also, the fee is paid on the station, using the prepaid contactless card (shared with Metro), or paying to the guard. Since bus numbers, route descriptions and other information are in Persian, your best bet is to look confused at a bus terminal; a local will surely stop to help. Each bus line has a certain and almost invariable path but only people know exactly which bus stations exist for a certain road. You shouldn't expect a map or guides even in Persian showing the bus network or bus stations. Even asking the bus driver wouldn't be a great help for you to find your way either. If you get in a bus and looking for a certain station to alight, ask one to help you - you will find many people wish to help you to find your way, most of the time. The BRT buses are colored in red. BRTs has special lines and travels very quickly from Azadi square (west of Tehran) directly to the East (Terminal-e-Shargh). Railway square (south of Tehran) directly to the north (Tajrish square). Azadi square to free university (northwest). Azadi Square to South Terminal and parkway bridge (north of Tehran) to jomhuri square. Costs 1,000-3,000 rials. In high-traffic hours (07:00-09:00 & 16:00-20:00), it is the best way to traveling. BRT has many stations near main streets. Although you may not find an empty seat on the bus because of the crowds, people give their place to you if they know you are a tourist. The women's and men's seats and queues are separate. Tehran's metro system has seven lines that will whisk you quickly from one end of the city to the other without having to deal with the noise, pollution and chaos of Tehrani traffic. However, many residents decided to leave their cars and commute by metro, so expect huge crowds during rush hours. There are seven lines but the two most useful are lines 1 (north to south- from Tajrish Station to Haram-e-Motahar Station) and 2 (east to west) which connect at the central Imam Khomeini station. All stations have signs in Persian and English. Trains run every 10 minutes or less on rush hours (15 minutes on Fridays and holidays) from around 05:30 to 23:00 every day. Line 6 (pink line) appears on route maps already, but is not operational (as of Jan 2019). Tickets are valid for 1 or 2 trips (including change of lines) and cost 10,000 rials for a single (Mar 2019). There are ticket booths at every station. You can also buy a contactless fare card which is the best option if you are going to use metro a lot, or want to have less hassle by paying 50,000 rials for a card and use it on metro and some city buses (if you use this card, you usually pay less than any other tickets, since they charge for the longest trip on the network). There are two dedicated women-only carriages at each end of the train. Women can anyway choose to travel aboard the other carriages but rarely do. There are a few apps for Android and iOS devices to assist passengers on using the metro. You can try downloading the Tehran Metro app which is made for foreign travellers. First you can find yourself on Google map (with stations marked on it) and your destination to decide which station you can get in and to which you want to arrive. After it you can select them on the stations map to get a textual explanation on taking directions and line changes along with a travel time estimation. As with the rest of the country private and shared taxis are abound in Tehran, although you may find flagging down a shared taxi more difficult amid the traffic and chaos, while private taxis are more expensive than in the smaller cities. See the Get Around information on Iran for details on flagging a taxi. If you want to get around by shared taxi, your best bet is to hop from square to square, as drivers will be reluctant to pick you up if your shouted destination deviates too far from their route. In each square you will find certain places where the private taxis are lined up in a queue and drivers call for passengers to a destination. (mostly happening during the times when the number of waiting taxis exceeds the number of passengers). In this case, they would wait until the car gets full of passengers (mostly one person at front and 3 people at back, excluding the driver). Otherwise the people have to line up in a queue waiting for the taxis to come. This is the case during rush hours (approximately 07:00-08:00 and 17:00-20:00). All these depend upon finding their regular station in the square. You can also ask them to alight sooner than your destination wherever you like but you have to pay their total fee up to destination. The cost of such a ride from Azadi square to Vanak Square is around 10,000 rials for each person. Most drivers are very poor at English though. Snapp is also the Iranian version of Uber in Tehran which is fairly cheap and the price is calculated in advance. The app can be downloaded from Google Play Store and Apple App Store and is available in English and French but a local SIM card is required to activate it. Although the drivers may not be good English speakers, the support line speaks English well and can handle the communication problems between you and the driver. Motorcycle taxis are a Tehran specialty and offer a way to weave quickly through the city's traffic-clogged streets. You'll see plenty of these drivers standing at the side of the road calling "motor" at all who pass by. Motor taxi operators can seem even more suicidal than the average Tehran driver. Agree on a price before you take off and expect to pay slightly less than chartering a private taxi. 1 The Azadi Tower, Kuy-e-Mehr Abad (Azadi Square Subway Station). The longstanding symbol of Tehran was constructed to commemorate the 2,500th anniversary of the Persian empire, combines elements of Sassanid and Islamic architecture. The entrance of the tower is directly underneath the main vault and leads into the Azadi Museum on the basement floor. Do not sit on the grass! Officers chase away people. 2 Mausoleum of Ayatollah Khomeini (The Tomb of Imam Khomeini), near to Behesht-e Zahra, Cemetery Highway (بزرگراه بهشت زهرا) (Metro: Haram-e-Motahar NW 300m,). The gigantic mausoleum is on the southern edge of the city. The sheer size of the shrine/shopping centre is enough to make the trip worth it. Women can borrow chadors at entrance. Bags have to be left for free at one of the compound doors. Entrance is free. 3 Milad Tower (برج میلاد) (from Metro Tarasht 3.5 km NE or from Metro Hemmat 4 km W), ☎ +98 21 8436 1000. 435 m-high Milad tower is the fourth-tallest tower in the world and 12th-tallest freestanding structure in the world, and it is visible from almost everywhere in Tehran. Tickets to enter the observation lounge must be reserved well in advance. There are several restaurants in and around the tower, and a mediocre art gallery. 2 viewing decks exist: indoor sky dome at 305m - 350,000 rials, outdoor viewing deck at 250m - 120,000 rials. 4 Treasury of the National Jewels, Ferdosi St (فردوسی), near the corner of Jomhuriyeh Eslami Ave (Metro: Saadi 300 m NE or M: Imam Khomeini 200 m ; look for the heavy iron gate and rifle-wielding guards beside the Central Bank'). Sa-Tu 14:00-16:30. If you want to drool over gold and glitter, take a look here. You'll get to see a collection of some of the most expensive jewels in the world. Highlights include the world's largest uncut ruby, the world's largest pink diamond (the Sea of Light) and a free-standing golden globe made from 34 kg of gold and an astounding 51,366 precious stones. The collection comprises a set of crowns and thrones, some 30 tiaras, numerous aigrettes, jewel-studded swords and shields, a vast amount of precious loose gems, including the largest collections of emeralds, rubies and diamonds in the world. It also includes other items collected by the Shahs of Iran during the 2,500-year existence of the Iranian kingdom. 200,000 rials admission fee. An informative 6,000 rials information book is available. 5 National Museum of Iran (Iran Bastan Museum, Persian: موزهٔ ملی ایران Mūze-ye Millī-ye Irān), 30th Tir (سی تیر) (M: Imam Khomeini 200 m SE, - 30th Tir St. and Imam Ave. Intersection), ☎ +98 21 670 2061 (/6), fax: +98 21 670 2648. 08:00-19:00 (mar 2019). The has ceramics, stone figures and carvings dating all the way back to around the 5th millennium BC. It is the combination of two museums, the old building (entrance fee: 300,000 rials) dedicated pre-Islamic collection dating from Neolithic to the Sassanid period and the new building (entrance fee 200,000 rials) dedicated to Iran's 1,400-year Islamic history. Building One consists of three halls. The three halls contain artifacts from the lower, middle, and upper Paleolithic, as well as the Neolithic, Chalcolithic, early and late Bronze Age, and Iron Ages I-III, through the Median, Achaemenid, Seleucid, Parthian, and Sassanid periods. The post-Islamic part of the museum was inaugurated in 1996 and consists of three floors. It contains various pieces of pottery, textiles, texts, artworks, astrolabes, and adobe calligraphy from Iran's 1,400-year Islamic history. Also here find: Islamic Period Museum. 200,000 rials, 300,000 rials. 6 Golestan Palace (Persian: کاخ گلستان pronounced 'Kakheh Golestān', Rose Garden Palace, Gulistan Palace), Khordad Sq. 15, Pamenar (پامنار) (M: Panzdah-e-Khordad 300m), ☎ +98 21 3311 3335, fax: +98 21 311 8338. 09:00 - 18:00, museums close at 17:00. The oldest of the historic monuments in Tehran. The complex consists of 17 palaces, museums, and Halls. The Golestan (Rose Garden) citadel is one of mainly visited places in Tehran, which was the Qajars' royal residence, and its garden is an oasis of coolness and peace in the heart of the city. The major building, architecturally unpretentious, houses a museum with objects from the Qajar period in the self-important style of last century. In the Golestan garden, a one-story pavilion to the right and a short distance from the entrance, shelters one of the best organized museums in Tehran. It encloses about thirty showcases presenting almost everything related to Iran, which makes up the critical originality of Iranian life in the a variety of provinces of the country. Golestan Palace was added to the UNESCO World Heritage List in 2013. 150,000 rials admission to the gardens, 300,000 rials for the main buildings and some other less important rooms (paintings and objects), 80,000 rials for other buildings and museums. More than 1 million rials total if planning to visit all of them. Takht Marmar (Marble Throne). A spectacular terrace (iwan) was built in 1806 by order of Fath Ali Shah Qajar (r. 1797-1834). Adorned by paintings, marble-carvings, tile-work, stucco, mirrors, enamel, woodcarvings, and lattice windows; the throne embodies the finest of Iranian architecture. The Marble Throne is one of the oldest buildings of the historic Arg. The existing throne, which is situated in the middle of the terrace (iwan), is made of the famous yellow marble of Yazd province. Khalvat Karim Khani (Nook terrace). This building was a part of the interior residence of Karim Khan Zand. The basic structure of its is similar to Takht-e-Marmar. There is a small marble throne inside the terrace. The structure is much smaller than Takht-e-Marmar and it has much less ornamentation. It seems extraordinary, but the valuable gravestone of Nasser-ol-Din Shah found its way to this quite corner of the Palace. This marble stone with a craved image of Nasser-ol-Din Shah is indeed a site to behold. Hoze Khaneh (Spring hall (Pond house) کاخ شهوند). The Hoze Khaneh was used as a summer chamber during the Qajar ear. A special cooling system pumped water form a subterranean system of streams (qanats) into small ponds inside the chambers. This system is no longer in use. European paints housed here. Negar Khaneh (the Gallery). Here are the paintings of the royal court, with the European paints housed in the Hose Khaneh and the works of Iranian painters housed in the Negar Khaneh (the Gallery). Meant to show the evolution of painting in Iran during the Qajar era, the works of Iranian painters are exhibited in two sections. Housed in the southern part of the Negar Khaneh are the works of early Qajar masters such as Mirza Baba, Mehr Ali Afshar, Ali Akbar Khan Mozaien-ol-Douleh, Aboul Hassan Sani (Sanie-ol-Molk) who was Kamal-ol-Molk’s uncle. Talar Berelian (Hall of Brilliance). The Hall was built by Nasser-ol-Din Shah build to replace another hall called Talar Bolour (Crystal Hall). Built by Fath Ali Shah the Bolour Hall had been laid waste by the damp. The Berelian Hall is famous for its mirror work and chandeliers. 7 Niavaran Palace (کاخ نیاوران), Pourebtehaj/Pvrabthaj (پورابتهاج) (From Tajrish Metro Station 4.5 km E. Taxis leave from Tajrish Square; ask to be dropped off at Niavaran Square ("maydoone Niavaran"). A taxi "dar baste" should cost 20,000-30,000 rials. While there are taxis at the front gate, on leaving the palace a cheaper option is to use a municipal bus which terminates at Tajrish Square. Look for a bus stop on Niavaran St. that is close to a branch of the Refah Bank), ☎ +98 21 2228 2012. This is a historical complex which consists of several buildings and a museum. The Saheb-Qaranieh Palace (صاحبقرانیه), from the time of Naser al-Din Shah of Qajar dynasty, is also inside the complex. - Jahan Nama Museum(کاخ‌موزه‌های نیاوران): Niavaran Palace, Niavaran Ave., phone +98 21 228 2012, Fax: +98 21 228 2079. - Cinema Museum(موزه سینمای ایران): Niavaran Palace Museum, Niavaran, +98 21 228 2012/5. 8 Masoudieh palace (Emarat-e Masoudieh), ☎ +98 21 3399 2013. 8:00 - 17:00. Built in 1879 for the prince Mass’oud Mirza - the son of Nasseredin Shah, the governor of Isfahan. 200,000 rials. 9 Safir Office Machines Museum (Persian: موزه ماشین‌های اداری سفیر, Ambassador Museum, موزه سفیر), No. 232, Kalantari? Cross, North Iranshahr street?, (خیابان ایرانشهر) (From M Ferdosi North? ), ☎ +98 21 8832 0320, fax: +98 21 8831 8804, e-mail: info@officemuseum.ir. F 11:00-16:00, Sa-W 09:00-19:00, Th 09:00-18:00. It was founded in 2008 by Frashad Kamalkhani, the museum owner. It includes a collection of early office machines. 10 Saad Abad Fine Arts Museum (Persian: کاخ سعدآباد, Kakhe malakeye madar, White Palace), Darband, Zafaraniyeh, Tajrish, Valiasr St (From M: Tajrish 1.5 km NW). Built in Neoclassical style, in 1920. 11 Glassware Museum of Tehran (موزه آبگینه و سفالینه , Abguineh Museum), Behjat Abad.- Jomhoori (or Jomhouri?) Ave., or Republic Street?, Sytyr (30th Tir) St, No. 55-75? ; (From M: Hassan Abad 0.7 km NE), ☎ +98 21 670 8153, fax: +98 21 670 5614. Tu-Su 09:00-17:00. 25,000 rials for foreign tourists, 2,500 rials for Iranian adults. 13 Reza Abbasi Museum (Persian: موزه رضا عباسی), Seyed Khandan, 972 Shariati Ave (before Seyed Khandan Bridge. It can be reached by the Resalat Freeway. - From M: Aliabad 500 m NE), ☎ +98 21 863001-2, +98 21 863003, fax: +98 21 863006. Tu-Su 09:00-17:00. Named after Reza Abbasi, one of the artists in the Safavid period, the collections of this museum belong to a period from the 2nd millennium BC to the early 20th century. 25,000 rials for foreign tourists, 2,500 rials for Iranian adults. 14 Tehran Museum of Contemporary Art (Persian: موزه هنرهای معاصر تهران), North Kargar Ave. (کارگر شمالی), ☎ +98 21 88963200, fax: +98 21 886 1664, e-mail: info@tmoca.com. Th-Sa 10:00-17:30. Features the works of great artists such as Van Gogh, Pablo Picasso and Andy Warhol. The collection of these paintings were selected by the former Empress Farah Diba. 16 Darabad Museum of Natural History (Dar-abad Nature & Wildlife Museum), Muzeh, Dar-abad (From Aghdasiyeh Subway Station 2km N), ☎ +98 21 22803539, fax: +98 21 228 8254. 20 March-20 Sept: M-Sa 08:30-20:30, 21 Sept-19 March: M-Sa 08:30-18:30 Sunday. Iran's most famous museum for nature and wildlife. 17 Saadabad Palace, Vali Asr Ave (The Saadabad palace and museum complex can be reached by foot from Tajrish Square. Walk up Sa'dabad St. past the Arg Shopping Center and turn left on reaching Afraz St. Turn right at the next intersection and walk down Javdan St., again turning right at the next intersection. Go all the way up to the end of Taheri St. where the south gate is located. Entrance to the park is free, but you must purchase all tickets to the museums you want to visit beforehand at the gate. Be careful of traffic while walking there! ), ☎ +98 21 228 2031, fax: +98 21 228 2079. A palace built by the Pahlavi dynasty of Iran in the Shemiran area of Tehran. The complex was first inhabited by Qajar monarchs and royal family in the 19th century. Parts of the Saadabad Palace compound are museums, in which visitors can roam through and look at the rich history of Iran. The following museums make up the complex: Klara Abkar Painting Museum - Hossein Behzad (miniature) Paintings Museum, - Abkar Miniature Museum, - Fine Arts Museum (18th & 19th century European Paintings), - Kamaleddin Behzad Miniature Museum, - Mahmoud Farshchian Miniature Museum, - Mellat Palace Museum, - Military Museum (موزه نظامی), - Mir Emad Calligraphy Museum, - Ethnological Research Museum, - Iranian National Museum of War - Green Museum (Shah Reza Summer Palace), - Water Museum (Keeping, restoring and revenue operation of water in Iran). Rojat Palace, Ebrat Palace (Mother), Vessels Museum (Ashraf Palace), Dafineh Museum, Farideh Diba Palace, Natural History Museum - - Other buildings on complex area: Shahram Palace, Prince Palace, Leila Palace, Farahnaz Palace, Hamid Reza Palace, Gholamreza Palace, Nasiri Palace, Twin Ghajar Palace. Green Palace. Built in 1922-1928. Main parts of it: Waiting room, Reza Shah working room, Ceremonies Hall, Reza shah Dinning room, Corridor, Reza Shah Bedroom, Ceremony Hall. National Arts Museum (موزه هنرهای زیبا ?, Africa Museum) (in Baharestan district.). Part of Saadabad Palace. Shah gifts from Chinese, Indian's and African's Delegations. 18 Former Qasr Prison (Ghasr Prison, زندان قصر), Marvdasht? Qelichkhani?. Closed or moved? Now there is the Islamic Revolution Court? (دادگاه انقلاب اسلامی) - It was built by the order of Fat′h Ali Shah of the Qajar dynasty in 1790 in the form of a palace. 19 Time Museum (Tamasha-gah Zaman, تماشاگه زمان), Asad Abad? No. 12, Baqdadi St. (Baghdadi Bahar), (Zaferanieh St., Vali Asr Ave., Farmaniye district, north of Tehran - Bus BRT 7 to 'Baagh Ferdows'), ☎ +98 21 241 7336. Evolution of time-measurement instruments. In a building (700 m²) with a garden (0.6 ha). 20 Money Museum (تماشاگه پول), No.1, Daman Afshar (نبش کوچه دفینه), Mirdamad Street (Mirdamad Blvd? ), Vali Asr Ave (From Metro 'Haghani' NW 1km), ☎ +98 21 879 5994, +98 21 877 4745, fax: +98 21 877 4744. Coins and banknotes from different historic periods. 21 Former Towhid Prison, now the Edification Museum (Ebrat Museum), 11, Martyr Yarjani St, - Kushk Mesri St. (Ferdousi Ave., Imam Khomeini Sq. (ميدان امام خميني) - From Metro 'Imam Khomeini' 300m NW). Tours daily 10:00 & 14:00. Persian:بازداشتگاه توحید , The prison of Shah ages. It was an unofficial detention centre in Tehran, used against opponents of the Islamic Republic of Iran until its closure in 2000. 22 Paradise Garden, Baq-e Ferdous Park? (باغ فردو س), Delbar (From Metro 'Tajrish' West 1.1 km). 23 13 (Martyrs?) Aban Museum (شهدا), Imam (Sepah) Sq. (From M 'Emam Hossein' NW 0.7km), ☎ +98-21 670-1915. Sa-Th 09:00-20:00. Paintings, sculptures of people, kings, artists and scientists. Masterpieces of "Seyed Ali Akbar Sanati". 24 Air Force Museum, Karaj Highway (جاده مخصوص کرج) (Ekbatan Metro Station 1 km south), ☎ +98 21 600 9318, fax: +98 21 600 8168. 25 Akskhaneh Shahr (Photography Museum), Bahar-e-Shiraz Ave (From Haft-e-Tir Subway Station 0.8 km east), ☎ +98-21 884-8993. Ancient photos, tools and equipment. 26 Azadi Cultural Complex (Azadi Tower, Persian: برج آزادی, Borj-e Āzādi; translated: Freedom Tower, previously known as the Shahyād Āryāmehr (Persian: شهیاد آریامهر; English: King Memorial Tower)), Azadi Square (Persian: میدانِ آزادی), or Freedom Square (M: Azadi Square Subway Station), ☎ +98 21 602 3951, fax: +98 21 600 8168. Azadi Tower built in 1971 in commemoration of the 2,500th anniversary of the Persian Empire, this "Gateway into Iran" was named the Shahyad Tower, meaning "Kings' Memorial", but was dubbed Azadi (Freedom) after the Iranian Revolution of 1979. It is 50 m tall and completely clad in cut marble. 27 Coin Museum (سکه), Imam Khomeini Avenue, Amnar (امنار) (M: Imam Khomeini), ☎ +98 21 311 1091, fax: +98 21 311 3936. 28 Dr. Hesabi Memorial Museum, 8 Hesabi St., Zaferanieh, Vali Asr Ave (M 'Tajrish' 0.9km, 17th street corner), ☎ +98 21 223 1676, fax: +98 21 221 8548. Ethnological Museum, 15 Khordad Sq (Sa’ d-Abad Palace? ), ☎ +21 311 0653, +98 21 311 3335. 29 Geology Museum, Meraj Blvd?., Azadi Ave, ☎ +98-21 600-7537, +98-21 607-1981 (to 1990), fax: +98-21 600-9338. Daily 09:00-12:00, restricted to schoolchildren. History Museum, Afrouz St., Pirouzi Ave., Shohada Square, ☎ +98 21 878 8680, +98 21 878 8681, fax: +98 21 877 4744. Displays 500 works of art on the 200-year-old history of Tehran. 30 Iran Historical Car Museum (موزه خودروهای تاریخی ایران در), Lashkary Expressway, Karaj Highway (From Metro Chitgar SW 2.7 km - next to Sepah Store), ☎ +98 21 44 52 5892, fax: +98 21 44 53 7763. Th F Sa 08:00-20:00. The collection include 45 imperial cars, 2 royal carriages and 3 motorcycles. Iranian Electrical Industry Museum ? (صنعت برق ایران), Afrouz St., Pirouzi Ave., Shohada Square ?, ☎ +98 21 326 2328. 31 History Museum, Qobadian St., Vali Asr Ave (From Metro Haghani NW 0.5 km), ☎ +98 21 878 8683. Su-F 09:00-13:00; 14:00-20:00. Malek National Museum and Library (عکسخانه), Baq Melli, Imam Sq., ☎ +98 21 672 6653, +98 21 672-6613, fax: +98 21 672 7364. 08:30-13:30. Art collections, coins, stamps, carpets. National Arts Museum (Kamal-ol-molk St, Baharestan Sq), ☎ +98 21 311 6329. 32 Natural History Museum, 9 9 Qaem Maqam-e-Farahani Ave (M Mofateh 1 km east), ☎ +98 21 884 3498, +98 21 882 4513, fax: +98 21 883 1297. Sa-W 07:00-12:00; 13:00-15:00. Natural specimens pertaining to geology, zoology, botany, fossils of plants and animals on four level. Rassam Arab-zadeh Carpet (فرش) Museum, 7 First Boustan, Pasdaran Ave, ☎ +98 21 284 9775, +98 21 284 7911, fax: +98 21 284 7912. Sa-Th 09:00-20:00. Small rug exhibit (30 pieces). Saba House (صبا), No. 92, Zahiro-Islam St., Baharestan, ☎ +98 21 311 1246. Sa-M W-Th 08:00-16:00. Iranian Musician Memorial Museum. Stained Glass Painting Museum (نقاشی پشت شیشه), No.348, Hedayat St., (Sadi Ave.) (Hedayat & Tonekabon Intersection,), ☎ +98 21 752 6777. Tu-Sa 09:00-18:00. Tehran University Science Museum (Tehran University), ☎ +98 21 611 2629, +98 21 611 2701. Telephone, Post & Telegraph Museum (پست و تلگراف), Imam khomeini Ave, ☎ +98 21 670 0503, +98-21 671-028, +98-21 674-454, fax: +98 21 670 9170. Tu-Su 09:00-12:00; 13:00-15:00. Zoological Museum (تنوع زیستی) (Agriculture Faculty of Tehran University). National Museum of the Holy Quran (موزه ملی قرآن کریم). Den of espionage -former US embassy. Taleghani metro station. Closes at 18.30. Fee: 200.000 rials (Mar 2019). 33 Jamshidieh Park, Niavaran district, Omidvar (From M: Tajrish 3 km NE or from Aghdasiyeh Subway Station 2.5 km NW). It is one of the most picturesque and beautiful parks in Tehran. It is at the base of the Kolakchal Mountain. Mellat Park in Valiasr street is one of the largest recreation areas in the Middle-East. Niavaran Park is one of Tehran's famous and most pleasant public city parks. It is in the Niavaran district and is situated immediately south of the Niavaran Palace Complex. Additionally there are some large parks called "park-e-jangali" (literally "forest park") around (and some inside) the city which are very popular among the locals for picnic. The most famous one is Chitgar in the west of the city and is accessible via Karaj road. 34 Ab-o-Atesh Park and the Tabiat Bridge (پارک آب و آتش و پل طبیعت) (The closest metro station is Shahid Haghani (line 1); the park is also a 15-minute walk away from Vanak Sq). The Ab-o-Atesh (lit. "Water and Fire") Park is one of Tehran's newest and most impressive. The highlight of the park is the Pol-e Tabiat or Nature Bridge, which offers spectacular views of north Tehran and the Alborz mountain range. Populated by the well-to-do urban middle classes of Tehran, this friendly park offers a plethora of cafes and restaurants, most of which can be found along the Rah-e Joobi or Wooden Road Food Court (رستوران‌های راه چوبی) in the southern section of the park (nearly all of the restaurants there are open only after 20:00 as it is customary for Iranians to eat dinner late in the evening). The park and its surroundings also offer other services, such as a skate park. A1one (aka Alonewriter, tanha) graffitis and street art works are a sort of interesting stuff in Tehran's Urban Space. A famous local graffiti artist is at the centre of controversy about whether his work is art or vandalism, and you can see his early works on the Tehran-Karaj Expressway, on the southern side walls UP in Ekbatan and Apadana districts. A more recent work of stencil art is found at the entrance of the Saba Art Institute. - Kolahstudio-an Art Basement, Iranian Underground Arts. 35 Chitgar Lake (دریاچه چیتگر). Also known as the Lake of Martyrs of the Persian Gulf, is an artificial and recreational lake in the north of Chitgar Park. The total area of this complex is about 250 hectares; 130 hectares across the lake, and the rest of it goes for the coastal zone and resorts. The lake has good weather and a it's host of migratory birds in some seasons. 1 Tochal Mountain (تله‌کابین توچال), end of Velenjak St, Zafaraniyeh (Metro line 1 to Tajrish station, then minibus (15,000 rials) or a taxi to the telecabin entry gate. From the entry gate a minibus service (10,000 rials) can take you to the 1st station), ☎ +98 21 22404001-4. Th F 06:30 till sundown, Sa Su Tu W 08:30 - 14:30. A recreation area on Mount Tochal that offers hiking trails, a ski resort, gym and other activities. It's also a great place to get some scenic views over Tehran and enjoy a little peace and quiet in contrast to the bustling city. Usually people get to the top using cable car. Embarkation point of which is at the 2 gondola lifts' 1st station. However, if you're energetic (or strapped for money), you can simply hike all the way up. You can also start walking and hop on one of the telecabins at the next station when you get tired. If going to the top, bring a jacket, even in summer, as the summit is 4,000 m above sea level so it can be chilly. There are lots of restaurants and cafes near the 1st station and entrance gate, and only one canteen upper on the mountain - at the 5th station. Besides, there is an alpin coaster at the base of the gondola lifts that offers a scenic ride for 200,000 rials. Tickets range from 100,000-380,000 rials depending on how far up the mountain you want to go. Skiing 650,000 rials which also has a side bonus of priority boarding the cabins. 3 Darband, Darband (Taxis to Darband go from Tajrish metro station). This is the alternative way to climb Tochal mountain. The walk goes across a canyon to Tochtal (مسیر کوهپیمایی به توچال از طریق دربند). Short-ride chair lift is also available here and leads to the upper platform, operates only during weekend Th–F 07:00–18:00. 4 Darake (دركه), Darakeh (The easiest way to get there is to take a taxi or minibus from Tajrish Square). This is another entry point into nearby mountains. Like Darband, Darake hiking trail begins with tens of open-air restaurants alongside a stream. Loghatnameh Dehkhoda Institute & International Center for Persian Studies is the only school which offers Persian courses and can arrange student visas for foreigners. Consult the timetable at their website and apply at least 3 months before. People with tourist visas are not allowed to attend classes. It is easy to find work in Tehran, but you must have a university diploma to be applicable for good jobs. Although there is some inflation, many of the people in Tehran have good and well paying jobs. Like every other big developing world city, there's a big difference between poor and rich. For information on Iranian currency see Iran#Buy. You can exchange your currency in most banks after filling out between two and five forms, but the exchange rate in exchange offices (sarraafis) is always better than what is offered by banks. It is much advisable to go to one of these 1 money exchange offices at Ferdosi Ave (close to Jewels Museum). Such offices can also be found in other parts of the city, but are far more scattered. Ask them to show you a copy of their license, issued by the Central Bank of the country and/or the local guild. A list of licensed sarraafis of the whole country, in Persian (Farsi), can be found here. This list includes phone numbers and addresses as well as license numbers and dates. Also, most exchange offices in Tehran don't exchange before 09:00, when the daily rate gets fixed. Do not exchange your money with one of the many individuals offering to exchange along Ferdosi St. It is much riskier and illegal. They might be criminals offering counterfeit money. As for March 2019, exchange offices in Tehran were not exchanging, and they announced lower rate than at the airport. The best rate was (surprisingly) at the airport, and higher than stated at XE Currency Exchange, but be aware that accommodation can be paid in euros, so you do not need to exchange all the money for the trip. In March 2019, they were changing 151000-153000 rials for 1 euro; 170000-173000 rials for 1 pound; 132000 rials for 1 dollar - at the airport, first floor (departures). There are also numerous shopping malls in the city. Valiasr Street and Tajrish Square (also includes a traditional bazaar) are two of the many locations full of shopping centres in Tehran. 2 Grand Bazaar of Tehran (بازار), Panzdah-e-Khordad St (0.5 km SE from metro Panzdah-e-khordad. Ask for Zaid Mosque (امامزاده زید) at Northern limit of the Bazaar). Wander around Tehran's massive bazaar. The main entrance on 15 Khordad Ave leads to a labyrinth of stalls and shops that were once the engine room of Iran's commodity markets and one of Imam Khomeini's greatest sources of conservative, pro-Revolution support. As usual, shops are clustered according to the products they sell. If you're planning on heading out into remote areas, the bazaar is an ideal and cheap place to stock up on almost anything you need. 3 Milad-e-Noor Mall, 2nd St/Farahzadi St (North 0.5km from Pardisan Park -). 4 Behjat Abad Market (Bazar Roze Behjat Abad), Aban Street (خیابان آبان) Karimkhan St (From Shahid Nejatolahi Subway Station SW 0.7 km - East from Behjat Abad Park). For those interested in cooking, Behjat Abad Market offers a good variety of fresh ingredients all year round. 5 Palladium Mall, Moqadas Ardabili St (BRT Line 7, Homayooni stop (همایونی)). The confectionery shop next to the supermarket is perfect for shopping souvenir sweets. Though on the pricey side by Iranian standards, the quality of the sweets is also high. Look out for the Tehranis who are wearing traditional black chadoors; they are a distinct minority among the well-to-do clientele of this ultra-modern mall. Due to Iran's refusal to sign the Berne Convention, the sale of pirated software is legal in the country. However, bringing the software home is likely to be illegal and may carry large fines or jail sentences if caught. The software might also not include the correct ID keys and therefore might not work on your computer. Buyer beware! Places where pirated software is for sale include the bazaar at the corner of Vali-e-Asr Avenue and Enghelab Avenue, Bazar-e-Reza, Bazar-e-Iran, and the "Paytakht Computer Complex", a modern complex of seven storeys filled with computer equipment at the intersection of Vali-e-Asr and Mirdamad. The prices at the "Bazaar Reza" (at Charrah-e-Vali-e-Asr) are usually cheaper. Some of the computer equipment that is sold in Iran are cheap knockoffs. 6 Paytakht Computer Complex, At intersection of Vali-e-Asr and Mirdamad (From M 'Haghani' West 1.7km). Jewellery & gold boutiques in Geisha, Milade Noor, Karim Khaan St. Golds, gems, and diamonds. Designer bags and shoes such as Gucci, Versace,Dior, Armani in Golestan shopping centre & Milade noor. Prices quoted on the menu may exclude an 8% tax, a 10-15% service charge, and a 10% tip. Be prepared to add as much as 1/3 to the prices quoted on the menu. You'll find cheap & good enough abgoosht stew in any of the places they call ghahvekhuneh (قهوه‌خانه) which you can find in any non-strictly-residential area. Just ask for a ghahvekhuneh or get this قهوه‌خانه printed and show it. Nice traditional working class ambience as a rule. You can find several food courts around Tehran with a variety of cuisines from Thailand, India, Italy, China and Turkey. Cafe Bork, No.6 , Abdi Nejad Alley, 16 Azar St., Keshavarz Blvd., ☎ +982188985049. 10-21. Cafe and vegetarian foods. Delsin Sandwiches, Jordan Blvd, in Golfam St. Kebab and sandwich joints are found everywhere. This one has interesting salad, and humus (lebanese mezeh). They have roast beef, chicken, turkey sandwiches that comes with fresh vegetables, like mint and basil. andwiches priced between US$2-4. Dizi Sara, Jordan Blvd. A hangout of the rich and famous. Abgosht (meat stew) 400,000 rials. Falafel Stalls, 15 Khordad Ave (across the road from the bazaar). 10,000-25,000 rials. Food Court at Jaam-e-Jam Mini Mall, Corner of Vali Asr Ave & Taheri Street. A sight to see - not for the food. This is the closest thing in Iran to a pick up bar. Teenagers push the limits on acceptable clothing. Has western import products in several stores underneath. There is also a decent bakery here with western type bread. Iranian Traditional Restaurant, 28 Keshavarz Blvd (near Agha Bozorg Mosque, underground, down a staircase east of the Canon/Konica shop). Young Iranians flirting, smoking flavored water pipe, and eating. The dizi is recommended. Dizi: 55,000 rials. Super Star Fried Chicken (SFC). The Iranian version of KFC. Serves very good chicken burgers. 1 Traditional Restaurant Karimkhan, Karim Khan Bridge/Blvd.. A cozy place serving fantastic Dizi among other traditional dishes. Cute little canaries are flying around. Dizi: 170,000 rials. 2 Restaurant Moslem, Bazar, District 12 (North West corner of Sabzeh Meydan Square), ☎ +98 21 5560 2275. Huge (very huge!) portions that are hard to finish. That is why most of the locals pack about half the portion for take-away (free). The canteen-like place is super crowded at lunchtime and the people form a long queue. Get an ordering number at the entrance first. Upstairs you can watch the bustling square while enjoying your meal. When in the Bazaar, don't miss out the 'Sharafol-eslam' restaurant in the Bazaar. It is very famous for its kebabs and chickens, excellent food, excellent quality, you'll never have enough. It gets really crowded though, which requires some patience. Armenian Club, 68 Khark St (corner of France Ave - Unmarked. Look for the ornate door). Since this is a Christian restaurant, women are allowed to remove their headscarves and alcohol is served (albeit at very inflated prices). The food is Iranian - not Armenian. There is usually a piano player performing. Muslims are not permitted inside. Kebab: 300,000 rials. Barbod Restaurant, 87 Seoul St.; Vanak Square. Dizi, near Karimkhane-e Zand St. downtown. A beautiful Dizisara. With many Miniature paintings on walls and a nice meal of Abgusht (traditional Iranian soup-like food, but way heavier than normal soups), it is worth a visit for lunch. Not open for dinner. Farid, 39 Shahid Sereni St (5-minute walk from Vali Asr Street). Speciality is the steamed blue fish. Hani, Corner of Vali Asr Street & Motahari Street. Delicious Iranian food served buffet style. Iran Tak, 431 Vali Asr Street (Just north of the metro station. Look for the unmarked ornate blue tile entrance and a staircase down to the basement). Ambient cellar restaurant with ornate chandelier and fountain. Popular with young people since water pipe smoking is allowed for both men and women. Try the lamb leg dishes. Complete meal with drink: 250,000 rials. Khayyam Restaurant (200m south of the Khayyam metro station, opposite the mosque). Beautifully decorated, originally part of the mosque. 300-year-old building restored in 2002. Typical Iranian food. Sofre-Khaneh Sonatee Ali Ghapoo, Gandhi Ave, ☎ +98 21 8877 7803. 12:00-15:00 & 19:30-23:00. Basement restaurant. Popular with large groups of Iranians. Very noisy. Live music starts at 21:00. Enjoyable atmosphere with waiters in traditional dress. SPU Restaurant, Darakeh Square, ☎ +98 21 224 19494. Iranian food. Ranked as one of the best outdoor restaurants in Tehran. Alborz Restaurant, Nikoo Ghadam Alley & North Sohrevardi Avenue. Many locals regard this as a fairly good chelo kababi in Tehran. Bistango @ Raamtin Hotel, 2153 Vali Asr Street. European décor and cuisine. Serves high-end dishes such as filet mignon, caviar, prawns. Boulevard, 3 Nahid Boulevard (on a small street heading east of Valiasr Avenue between Vanaq Square and Park-e Mellat), ☎ +98 21 2205 1947. Trendy and modern place; serves very good French and Italian food. Dashte-Behesht (Saadat-Abad). Very high class, the menu consists of different kebabs and stews. There is always live music to make the atmosphere more enjoyable. Divan, Fayazi Blvd (Fereshteh) (SAM Shopping Center - 8th Floor), ☎ +98 21-22653853. 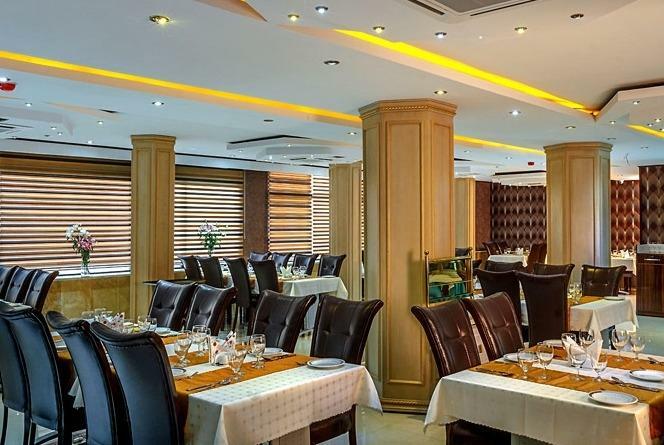 Fusion Persian food in a luxurious setting. Consistently ranked as one of the best restaurants in Tehran. Gilac, 15, Parc des Princes, Kordestan highway, ☎ +98 21 88 03 04 04. Specializes in fish from the Caspian Sea. Monsoon, 8 Gandhi Street (Shahid Ghandi Shopping Center). The best Asian restaurant in Tehran, serving good Thai curries and decent sushi. European décor and music. Nayeb, 2220 Vali Asr Street (Across the street from the Raamtin Hotel). Traditional Iranian food served in style. Ranch, No.108, on the corner of Satari and Afriqa (Jordan) Blvd, ☎ +98 21 8865 1618. An Italian restaurant opened in 2014 by Valentino Salvi. Nice outdoor eating space. Bahar Confectionary, Sarcheshmeh Crossroad (Beside Keshavarzi Bank). The oldest Confectionary of Iran founded 1938. birthplace of paderazi and sugar bread. Best Known for traditional Paderazi and Shekari cookies. Quality is guaranteed. Diverse range of cookies and pastries are available. Coffee shops are a great place for people watching as well as drinking. There is a string of coffee shops on the south side of Jomhuriyeh Eslami Ave, a couple of hundred metres west of Ferdosi St. You can stock up on coffee beans and related paraphernalia, or even sample a cup for 4,000 rials. Cafe Naderi - serves coffee, tea and pastries to a mix of Tehran's intelligentsia and bohemian elite. It's a great place to sit and watch hip young guys eyeing gossiping girls while old men reminisce about the "good ol' days" under the Shah. Gramophone Cafe, Charrahe Vali-e Asr (Vali-e Asr St. - In front of Theatre building). If you want talk to your friends, you can go to Gramophone coffee shop, listen to nice music, and have a nice coffee. Some of people who work there can speak English. Ask for Beiruz. Hot Chocolate Coffeeshop - they stock cigars and a number of European cigarettes as well. This coffee shop is on occasion, a meeting place for some of Iran's sporting elite. Sanaee Coffee Shop, Sanaee St, 13th Street. Definitely worth it for their absolutely fabulous chocolate milkshakes. Try the 'Icepack' chain with their huge sortiment of milk- and ice-shakes. Popular with the Iranian youth. White Tower (Borj-e Sefid) along Pasdaran Ave, Definitely worth a visit if in the area- try "White Rose" in the White Tower. Azari Traditional Tea House - Just north of the train station. A bit far from the center but worth the trek. The atmospehere here is unique, from the moment you enter from the beaded doorway. This is a popular hangout for people of all ages. Features an eclectic collection of water pipes and tea pots. Chai bar (Anjoman Khoshnevisan), 145 North Salimi Blvd (Farmanieh), ☎ +98 21 22210310. In a beautiful historic garden in Tehran. It is an ideal place to spend late afternoons/evenings. It offers great selection of teas and coffees as well as sandwiches. Entracte Cafe, (upstairs in a cinema on Jomhuri Ave ,just west of Valiasr Avenue ). An atmospheric and bohemic cafe operated by actress Leila Hatami and her husband. Ask for the traditional Iranian tea which is amazing. They serve a fantastic brunch 11:00-14:00 on Fridays and it includes sausages, bread and brie. Damaged by fire but possibly re-opened. Gandhi Shopping centre. For trendy cafes filled with liberal Iranians. You will find about ten coffeshops as well as a few very good restaurants, including Monsoon. In many places you can find fresh sickly-sweet carrot juice - as well as some other juices - for just 30,000 rials a cup. By most main bazaar in Tehran you can get a drink of blended honeydew melon with ice and sugar. Its delicious and extremely refreshing on a hot day. In the summer, you can try Khakshir a locally made amazing drink which is refreshing. The old styled Mosaferkhanehs and budget hotels are often low quality and overpriced. The reason is that Iran has had very limited exposure to the outside world. In many low budget places there are no European toilets or even no toilet paper and staff can be rather unfriendly with no English speaking ability. However, a couple of modern hostels have opened in Tehran. 1 Tehran Heritage Hostel, No. 22, Kamal-ol-Molk, Baharestan Square (Walk 100 meters to the west in Kamal-ol-Molk Street from Baharestan Square Metro Station. ), ☎ +982133988739. 24h. Check-in: 14:00, check-out: 12:00. The newly renovated Tehran Heritage Hostel sitting in a 100-year-old-building opened in January 2018. The location is very central and Baharestan metro station is just round the corner. Dormitories have beautifully designed bunk beds with private curtains, individual lockers, sockets and light on each bed and private rooms are en-suite, beautifully decorated with stunning bed linen. Useful and friendly staff, they can book your bus or train tickets for you. Dorms: from €5; Yurts: from €15; Privates: from €25, accepts payment in euros. Payment with card for a fee. Firouzeh Hotel, Dolat Abadi Alley, Amir Kabir St, ☎ +98 21 33113508, +98 91 24361974 (Cell), e-mail: info@firouzehhotel.com. Check-out: 14:00. Good hotel with very friendly receptionist, Mr Mousavi, is a good source for information, especially regarding embassies and visas. Great place for breakfast, tea and meeting other travellers. Internet and wifi available. Single: US$28 (870 000 rials, Sep 2016); double: US$30. Hotel Hafez, Bank Alley, off Ferdowsi Street, ☎ +98 21 66709093, e-mail: hafezhotel@yahoo.com. Location quite good, 5-min walking to National Jewelry Treasure and Turkish Consulate, with nearby currency exchange places. The duty manager (an old gentlemen) is very nice and speaks good English. Rooms are good and clean, bathroom water is hot. Can help you book train/bus/flight tickets, car/van or even visa renewal. Breakfast included. Free Wifi, but signal is not good in the room. Double: US$74. 2 Hostel in Tehran (See You in Iran), No. 2, Vahdati-Manesh (3rd) Dead End, South Kheradmand St., KarimKhan Ave, ☎ +98 21 88832266, e-mail: info@seeyouiniran.org. accommodation for cultural exchange. It features eight private rooms, two dorm rooms, an event-based café, a spacious outdoor garden and is run by a multilingual team. Hotel Khazar Sea, 12 Ohady Alley, Amir Kabir St, ☎ +98 21 33113860. Very friendly place and relaxed atmosphere around quiet courtyard. Single room from 140,000 rials. Mashhad Hostel, #388 Amir Kabir Street, Opposite Seraj Mosque, ☎ +98 21 33113062, e-mail: mashhadhostel@yahoo.com. One of the cheapest accommodation in Tehran. Nothing fancy and not exactly very nice but the obvious choice for those on a budget. Has a small kitchen with possibility to boil water and a dial up Internet connection. They do laundry for a reasonable price of 30,000 rials. Dorm beds, single or double. Price for double Dec 2016 500 000 rials. 3 Hotel Naderi, 520, Jomhouri Ave, ☎ +98 21 21 6670 8610, e-mail: hotelnaderi@yahoo.com. One of the cheapest hotels outside the grubby Amir Kabir Street. Still in central Tehran but Jomhuri Ave. has more restaurants than Amir Kabir St. Hotel Naderi is an old famous hotel where writers and intellectuals still meet in the downstairs Cafe Naderi. Some bathrooms are very old and somewhat dirty but the beds are reasonably clean. Ask for a room in the back to avoid the noise. Not to be confused with Hotel New Naderi. 300,000 rials for a single. 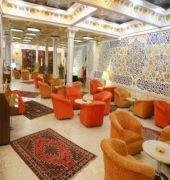 Hotel Saadi, 375 Laleh Zarno St (get off Metro at Saadi Station. Walk down Jomhouri, it's very close from the metro, the intersection is Laleh Zar to the left and Laleh Zarno to the right. Go right and then the hotel is on right side of street about 200-300 m.), ☎ +98 21 33117653. Very new small hotel with free wifi for guests. Single: 850,000 rials; double: 1,240,000 rials. 4 Yas Hotel & Guesthouse, 458 Laleh Zarno St (Near Hotel Saadi (see above)), ☎ +98 21 33903796, +98 21 33902111. Good location off Jomhuri Ave, close to Saadi Metro. Clean room and shared bathrooms. Clean and simple budget accommodation with shared bathrooms. Sink and TV in rooms. 200,000 rials. 5 7 Hostel (Seven Hostel), No 5, Dideh Baan Alley, Fakhr-e-Razi St, Enghelab St, Enghelab Sq (http://sevenhostels.com/addresses-and-directions), ☎ +98 21 88 68 15 16, e-mail: sevenhostels@gmail.com. In a villa not too far away from the center; it offers a veranda, kitchen and patient help for your time in Tehran. Dorm US$10; single/double starting from US$40; includes bread, butter, cheese, and jam breakfast. 6 Tehran Hostel, Malekoshoara bahar St. Gohar Alley . N.2 (Close to Taleghani Metro Station), ☎ +98 912 725 7703, e-mail: tehranhostel@gmail.com. Check-out: noon. Nice little hostel in a residential neighbourhood. Mori the manager is very nice and helpful. Clean dorm and bathrooms (only two (?) for the dorm). It's a good place to meet other travellers: those who just arrived and those who are about to leave. Free Wifi and breakfast: Mr. Mori gets fresh bread every morning and you are free to use the guest kitchen to fry some (free) eggs, boil water for tea and use the fridge. It takes some time to get to the sights but the location is nicer than most of the central hotels. Double €35, dorm €12.50. HI Tehran Hostel I (Bahar St. Branch, #2, Corner of Firooz Abadi Dead End., Tabatabaei Alley, Bahar Shomali Street (Take off from the Haft-e-Tir Metro station on the red line(Line 1). Leave at Mofateh Street exit. Go straight down until you see Shimi Alley (کوچه شیمی), turn left into Shimi alley and follow it until you get to Bahar-Shomali Street. Cross the street. Tabatabei alley on the other side of street is right in front of you. We are #2 on your left-hand side in Tabatabei alley. ), ☎ +98-912-053-0663, e-mail: stay@hitehranhostel.com. Check-in: 14, check-out: 12. Private rooms, mixed dorms and female dorms 13 € per bed per night. This place is clean with a super friendly staff, with a large variety of dorms and private rooms. Beautifully designed and noticeably clean private & dormitory rooms, working space, study & working room, kitchen & serving space, a green front garden which is a place to meet locals & get to know the local culture while relaxing and enjoying a traditional drink or meal, 24/7 reception, secured lockers, CCTV protection for common spaces, free Persian-style breakfast. 11€-100€$. Hi Tehran Hostel II (Enghelab St. Branch), #854, beside Abiverd Alley, Between college crossroad and Ferdowsi square, Enghelab St., Tehran (Get off at Ferdowsi station(Line 4) from south Ferdowsi Exit. Walk for 3 minutes toward west. After Abiverd Alley you will reach the hostel which is No. 854), ☎ +989120530663, e-mail: hitehranhostel@gmail.com. Check-in: 14, check-out: 12. Hi Tehran Hostel II (Enghelab St. Branch) is in the most famous historical/political street of Tehran, full of cafes, restaurants & art centers. 150 meters from Ferdowsi st and its metro station & exchange shops. 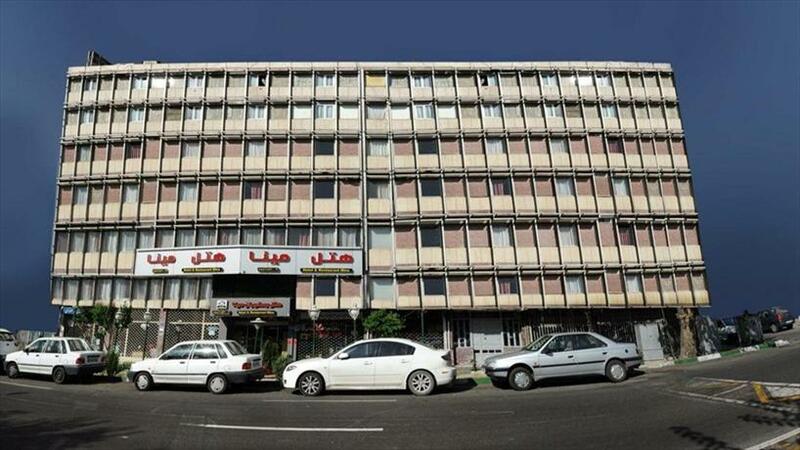 The newer of the two Tehran Hostels, it is in a renovated historical building which dates back to first Pahlavi period. Beautifully designed with clean private & dormitory rooms and other amenities as in its sister hostel. 24/7 reception, secured lockers, CCTV protection for common spaces, free Persian-style breakfast. 9-100£. 7 Bibi Hostel, No. 13 Ramsar Street, Ferdowsi Square (near Darvaze Dowlat Metro station and BRT (bus rapid transit) station), ☎ +98 912 378 0600, e-mail: hostelbibi@gmail.com. Check-in: 14, check-out: 12. It's near various cafes and Iranian restaurants popular with tourists and locals. 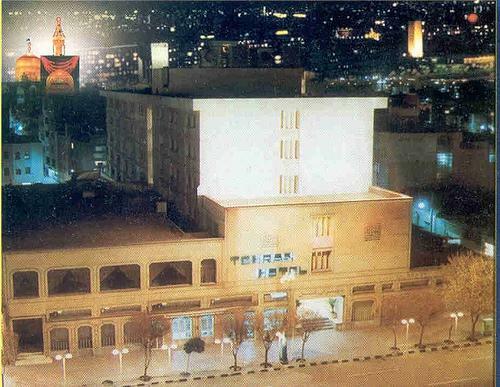 Amir Hotel, 325 Taleghani Ave. Between Iranshahr and Forsat, ☎ +98 21 8830 4066, +98 21 8830 4069, fax: +98 21 8882 4505, e-mail: info@amir-hotel.com. 70 nice rooms with a great location. Popular with business travelers. Double: US$83. Atlas Hotel, #206 Taleghaani Ave (7 minutes walk west of Taleqani metro station), ☎ +98 21 88907475, +98 21 88906058, +98 21 88900286, +98 21 88900288, fax: +98 21 88800407, e-mail: hotelatlas@yahoo.com. Check-in: 14:00. 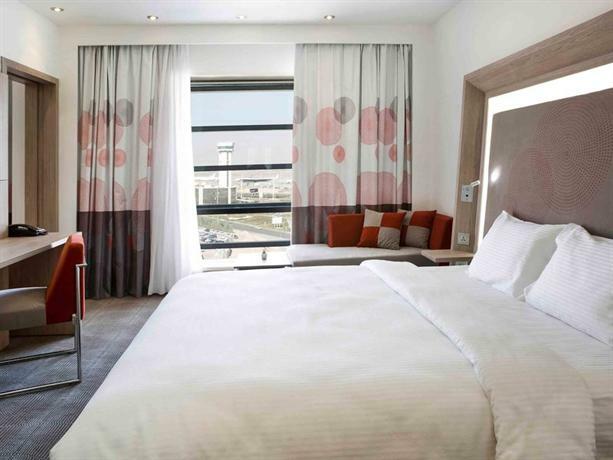 Two-star hotel in convenient location and good rooms. Insist on a room in the rear building as rooms in the front building face the very noisy Taleghaani Avenue. Must pay in USD or euros. Breakfast included. Single: $48; Double:$76; Triple: $97. Ferdowsi International Grand Hotel, No. 20, Kooshk e Mesri street, Ferdowsi Ave (Along Ferdosi Street North of Imam Khomeini Metro Station), ☎ +98 21 66727026, +98 21 66727031, fax: +98 21 66711449. Very nice and posh rooms and fantastic breakfast buffet. Centrally location. Highly recommended. Single US$99; double $140. Ideal Apartment Hotel (هتل آپارتمان ایده آل), Fatemi Sq Kamran Alley, No. 10 (in a small quiet street just off the busy Fatemi/Vali Asr intersection), ☎ +98 21 88920841, +98 21 88920850, fax: +98 21 88920839. Offers apartments with kitchens and separate sleeping rooms. While not palaces, they are good for self-caterers or people who face a longer stay in Tehran. Staff is motivated and speaks English. US$80 including buffet breakfast. Iranshahr Hotel, No 81, South Iranshahr Street, ☎ +98 21 88846650, +98 21 88820518, e-mail: info@hotel-iranshahr.com. Opened in 1953; renovated in 1981. Nice rooms and good service. Single US$70; double $98. Hotel Mashad, 190 Mofatteh St, near Talequani ave., e-mail: info@hotelmashad.ir. Rooms are renovated but small. Some rooms have a view into the former US embassy complex. Single US$59; double $84. Hotel New Naderi, off Jomhuri-ye Eslami Ave #53, Gohar Shad Alley, ☎ +98 21 66709530, +98 21 66703761, +98 21 66701356, +98 21 66709531, fax: +98 21 66709532, e-mail: newnaderihotel@yahoo.com. By 'new', they mean 1970s. Clean rooms. Single US$44; double $63. 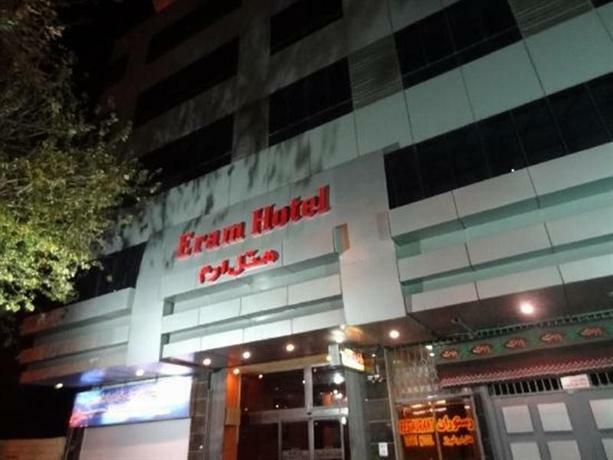 Parasto Hotel (Parastoo Hotel), Mohammad Buyk Alley, off Jomhuri-ye Eslami Ave (Near the British Embassy, a bit of a hike from Ferdosi Metro), e-mail: hotel_parasto@yahoo.com. Basic hotel popular with tour groups. Rooms can be smoky or dirty. Single US$25; double $39. Espinas Persian Gulf Hotel, 126 Keshavarz Blvd. 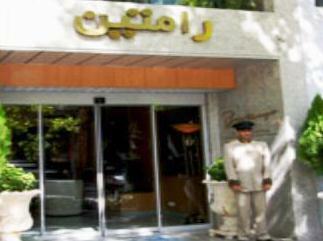 Opened in 2010, it is one of the nicest hotels in Tehran. 224 rooms, gym, sauna, pool. Single US$168; double $224. Esteghlal Hotel, Crossroads of Dr. Chamran Experessway & Valie-Asr Ave. (near Elahieh and the International Expo Center), ☎ +98 21 2266 0011, +98 21 2266 0025, e-mail: reservation@esteghlalhotel.com. Formerly a Hilton hotel. 15 floors, 550 rooms, built in 1962. 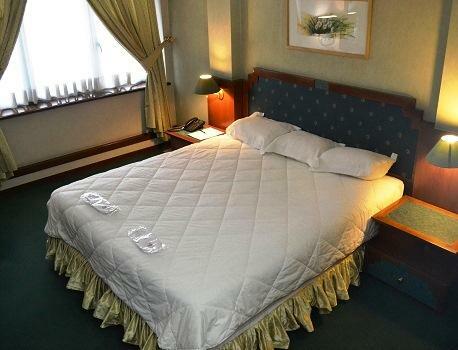 Homa Hotel Tehran, #51, Shahid Khodami St., Vali-e-Asr Ave., Vanak Square, e-mail: Tehran@homahotels.com. Double: 3,700,000 rials. Raamtin Residence Hotel, 2153 Valiasr Ave (directly across from the gas station), ☎ +98 21 8872 2786, +98 21 8872 2788, e-mail: info@raamtinhotel.com. 50 spacious rooms with leather couches. Single 3,200,000 rials; double 3,900,000 rials. 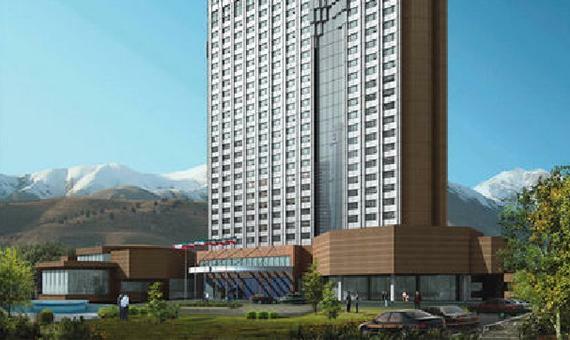 Simorgh Hotel, 1069 Vali Asr. Nice location on cosmopolitan upmarket section of Valiasr St. Saei Park is almost next door and a beautiful green/concrete oasis in a deep valley. Hotel was once the Miami Hotel, and on the top floor is still the Miami Restaurant. Fairly good food - try the estrogen (sturgeon) fish kebabs, and the chicken cordon bleu. Good coffee in ground floor cafe. Rooms are comfortable and well equipped although rather dark. Business centre with fast internet and wifi in most rooms. Terrific indoor pool with separate bathing times for men and women. The hotel cars are in very poor condition, better to take a taxi from the street. Single US$168; double $205. You need to use a proxy server, VPN or a software like Freegate or Psiphon to access Facebook, Twitter, YouTube and some websites; otherwise, you might see this page which shows that the site you want to access is filtered and blocked by the judiciary system. You also need to use Freegate to check your bank account balance; otherwise, your account might get blocked due to the sanctions against Iran. Ferdosi Coffee Net - Enghelab Ave, (a few doors east of Ferdosi Square) is hard to find (look for the small sign plastered to a building) has two banks of computers. Pars Net - one of south Tehran's hottest coffee nets, dishing up reasonable speed. It is on the eastern side of Ferdosi St, between Jomhuiyeh Eslami Ave and Enghelab Ave, across from the British embassy. They also provide fax and long distance phone services. Iranian Trade Centre - around Valiasr Square offers several Internet cafes (coffee nets). In addition to the above caffes, there are many others in all parts of the city. With a copy of the information page of your passport and a copy of the page with Iranian entrance seal and also, your visa, you can buy SIM cards and access the internet with GPRS, EDGE, 3G and 4G technologies. SIM cards are available in places like post and government e-services offices (Persian: singular: Daftar-e Pishkhan-e Khadamat-e Dowlat دفتر پیشخوان خدمات دولت; plural: Dafater-e Pishkhan-e Khadamat-e Dowlat دفاتر پیشخوان خدمات دولت), in big shops and at the Imam Khomeini airport. At least some shops refuse to sell SIM cards to British nationals. Mobile Communications of Iran (IR-MCI) or Hamrahe Avval همراه اول is a cellular phone company that provides SIM cards with 3G technology. You need to activate special packages to access the internet with less cost. This company has the largest cellular phones network subscribers and its numbers begin with 091. IR-MCI SIM cards have better signal coverage on roads. Irancell is another company that provides 3G service along with the other cellular phone services. Its SIM card numbers begin with 093 and 090. RighTel (رایتل) is anothe company providing reliable 3G internet connections. Irancel, Rightel, MCI all have 4G coverage in big cities. Irancell Wimax is one of the wireless internet networks available. MobinNet ISP Company is another service provider which provides wireless portable internet connection. See also the warnings at Iran#Stay safe. Considering that the population of Tehran is around 15 million, it is still one of the safer cities to visit in global terms. Violent crime is rare and exercising common sense and taking the usual precautions against pickpockets in crowded areas should ensure a hassle-free visit. Most areas are safe even late at night, although it is not advisable to take a private taxi at 02:00 for example (but the lack of public nightlife means that few tourists would be out at that time in the first place). South Tehran (or the areas south of the Tehran Bazaar) is the only area that should really be avoided after dark, as some of the more deprived neighborhoods are there. Traffic in Tehran is very dangerous and should be considered to be among the worst in the world. Even though crossing the street might at first seem impossible, drivers usually do a very good job avoiding pedestrians. Still, try to cross the street when the locals do as there is safety in numbers. The rate of traffic accidents is disturbingly high, so faith should not be put on drivers' skills alone. The fake police that have traditionally targeted tourists in Esfahan have also found their way to Tehran. These are usually uniformed men in unmarked cars flashing fake IDs and requesting to see your passport or to search through your luggage. You should ignore such requests and head to the nearest police station ("kalantari") if you feel unsafe. However, it can be somewhat hard for the untrained eye to tell these apart from real police. If you decide to smoke the qalyan (waterpipe or hubble-bubble), make sure that you are not unintentionally smoking opium or any other kind of drug. Although drugs and alcohol are illegal in Iran, it is not impossible to get them, especially in Tehran. The government has banned smoking qalyan and cigarettes in public places, so finding a good place to smoke can be a challenge. If you really want to try the qalyan, do it only at a qahvekhane recommended by a Western guidebook or travel website. The traffic in Tehran is horrendous. To get a break from it, head to the parks in the north of the city. If the hustle and bustle of Tehran becomes too much, it's possible to go to the Caspian Sea for a day or two. The holiday town of Ramsar is about five hours away, and the drive across the Alborz Mountains is spectacular. A taxi round-trip for a day shouldn't set you back more than 500,000 rials (ask for taxis near Azadi Square). 3 Shemshak ski resort (پیست اسکی شمشک), Rudbar-e Qasran District, Shemiranat County, Tehran Province (1–2 hours north-east of Tehran in the Alborz Mountains.). its steep slopes are considered appropriate for expert skiers and boarders. The slopes lie at an altitude of 2550m to 3050m above sea level. 4 Dizin ski resort (دیزین), Tehran Province (70 km north of Tehran). This is a larger ski resort with more facilities and is considered better for beginners and intermediates. The resorts generate some rivalry amongst the locals, with some 'Shemshakis' looking upon those who ski in Dizin as 'kids in the park' and see Shemshak as the place for 'true skiers'. The ski season: from December to May. 5 Sorkheh Hesar National Park (پارک ملی سرخه‌حصار), Rey County, Tehran Province (17 km East from Tehran - Near by Ray - Tehran 20th Distric - By car from Khojir Road 14 km (8.7 mi) to Khojir, branches off in Zereshki Fork.). Perfect birdwatching place at an altitude of 1,547 m.